On April 23, Easter Sunday in the Year of our Lord 2000, Praise Lutheran Church held its inaugural Divine Service and Sunday School in a 1,400-square foot storefront at 536 E. Broadway near Washington. 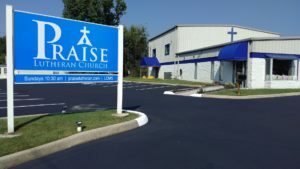 Since then, Praise Lutheran Church has grown from a mission plant supported by area churches and the Mid-South District to a vibrant and self-sufficient congregation that is able to reach out into our own community and support the mission of the Church. We have relocated to our own building on Big Springs Road, where our talented and generous members have transformed a steel building into a holy worship space with walls and ceiling, altar area, communion rail, and baptismal font. We invite you to join us for Divine Service and Bible Study on Sundays.